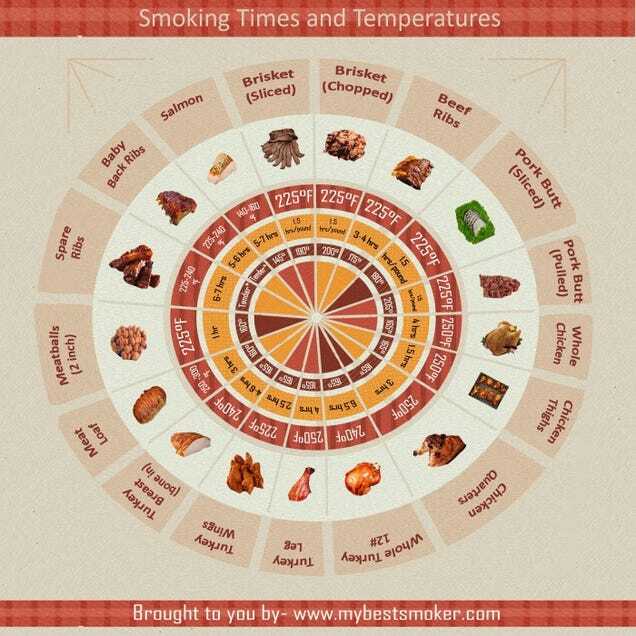 This chart, from My Best Smoker, covers the cook times and cooking temperatures of 17 of the most mouth-watering meats. You can learn to smoke brisket, salmon, chicken, turkey, ribs, and even hot wings. The outermost ring (light red) on the inside of each meat tells you what temperature to smoke at, then the yellow ring tells you for how long, and the brownish ring on the inside tells you the recommended internal temperature of the meat so you know when it’s done. The graphic is designed for use with electric smokers, but some of these suggestions may still work with charcoal or dry smokers. Amber Frazier-Finkelstein liked this on Facebook. Amy Bradley liked this on Facebook. Useful chart, thanks for sharing it. really useful, thanks for this post !